If I were to buy a home in Nashville, I definitely think it would be East Nashville. This up-and-coming eclectic neighborhood has a character and charm I love. Duke and I took a drive out there, taking in the cozy Craftsmans and locally owned businesses. There's a huge list of restaurants I want to eat at in East Nashville, and I love the quirky shops. It seems a bit hipster, definitely an eco-conscious area with a lot of people who value clean, green lifestyles, eating like a locavore, and shunning big business for a more pedestrian lifestyle vs. commuter. It's like a mini East Village in New York, or Portland, or Seattle. Today, being amateur burger connoisseurs, we decided to check out The Pharmacy. While parking is a challenge, it was well worth the effort. The beer selection is awesome, and we loved the atmosphere. 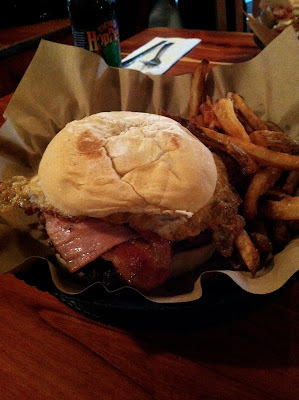 I had the Farm Burger, which was sheer burger decadence: a local beef burger topped with local bacon, ham, and a fried egg. A farm-fresh egg. Phenomenal. I washed it down with their homemade strawberry ginger ale. Delish! As far as Nashville burgers, Duke ranked The Pharmacy > Burger Up, because he liked the meat better. I ranked Burger Up > The Pharmacy for their house ketchup and truffle fries. But the burgers were equally awesome to me. Afterwards, we headed over to The Green Wagon, where I found a gloriously-scented candle and lip balm. It definitely reminded me of the little shops in my hometown, with tons of eco-friendly fare. We also stopped at Porter Road Butcher, an old-fashioned butcher shop nearby. I was in love. So much delicious, local meat! Farm fresh eggs! Homemade jams and breads and cheese! Milk! Jerky! We picked up some eggs and steak, but we will definitely be back for some special meat purchases; it's well worth the trip, and the guys are experts. I had my eye on some Italian sausage and chorizo for next time.